Scott Sommerdorf | The Salt Lake Tribune Olympus' Jeremy DowDell is sent flying by Bountiful's Brig Willard during this second half trip the hoop. Olympus beat Bountiful 79-43, in a boy's 5A semi-final, FrIday, March. 2, 2018. 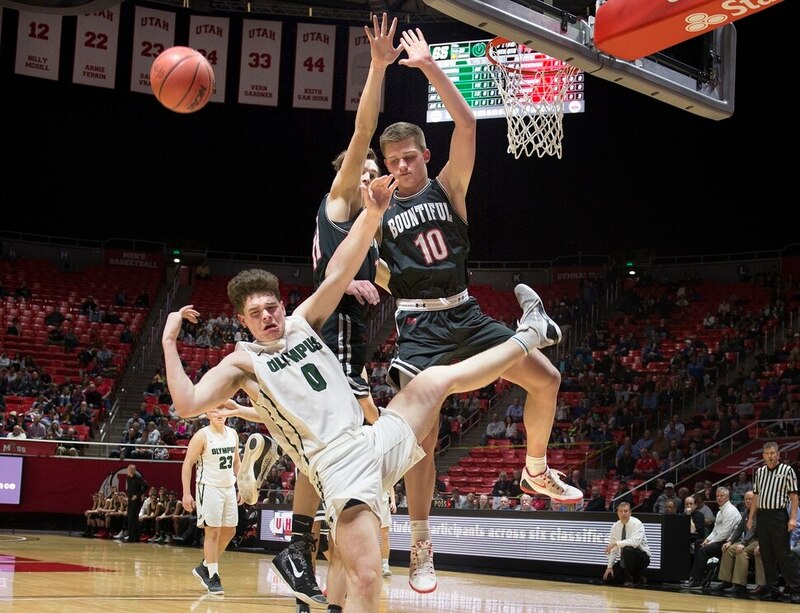 Scott Sommerdorf | The Salt Lake Tribune Bountiful's Camron Chism deems to be channeling the frustration all of Olympus' opponents have felt this year as he reacts to a first half play. Olympus beat Bountiful 79-43, in a boy's 5A semi-final, FrIday, March. 2, 2018. Scott Sommerdorf | The Salt Lake Tribune Olympus' Rylan Jones bring up the ball against David Stevenson of Bountiful during first half play. Olympus beat Bountiful 79-43, in a boy's 5A semi-final, FrIday, March. 2, 2018. Scott Sommerdorf | The Salt Lake Tribune Jeremy DowDell shoots for Olympus during first half play. Olympus beat Bountiful 79-43, in a boy's 5A semi-final, FrIday, March. 2, 2018. Scott Sommerdorf | The Salt Lake Tribune Olympus head coach Matt Barnes yells instructions to his team during second half play. Olympus beat Bountiful 79-43, in a boy's 5A semi-final, FrIday, March. 2, 2018. Scott Sommerdorf | The Salt Lake Tribune The Olympus student section enjoys their team's rout during second half play. Olympus beat Bountiful 79-43, in a boy's 5A semi-final, FrIday, March. 2, 2018. Scott Sommerdorf | The Salt Lake Tribune Spencer Jones makes a layup for Olympus during first half play. Olympus beat Bountiful 79-43, in a boy's 5A semi-final, FrIday, March. 2, 2018. Scott Sommerdorf | The Salt Lake Tribune Bountiful's David Stevenson has trouble with the defense of Rylan Jones during second half play. Olympus beat Bountiful 79-43, in a boy's 5A semi-final, FrIday, March. 2, 2018. Scott Sommerdorf | The Salt Lake Tribune Bountiful's David Stevenson loses control of the ball during this second half play. Olympus beat Bountiful 79-43, in a boy's 5A semi-final, FrIday, March. 2, 2018. Scott Sommerdorf | The Salt Lake Tribune The Olympus starters cheer on the second team after they were tarn out of the game. Olympus beat Bountiful 79-43, in a boy's 5A semi-final, FrIday, March. 2, 2018. Scott Sommerdorf | The Salt Lake Tribune Harrison Creer goes to the hop for Olympus during second half play. Olympus beat Bountiful 79-43, in a boy's 5A semi-final, FrIday, March. 2, 2018. Scott Sommerdorf | The Salt Lake Tribune Spencer Jones of Olympus laughs with Ethan Phillips of Bountiful while they wait for a second half free throw when the result was out of reach for the Braves. Olympus beat Bountiful 79-43, in a boy's 5A semi-final, FrIday, March. 2, 2018. Scott Sommerdorf | The Salt Lake Tribune Rylan Jones gives Jeremy DowDell a hand slap after DowDell took a spill during a second half trip to the hoop. Olympus beat Bountiful 79-43, in a boy's 5A semi-final, FrIday, March. 2, 2018. Scott Sommerdorf | The Salt Lake Tribune Olympus head coach Matt Barnes during second half play. Olympus beat Bountiful 79-43, in a boy's 5A semi-final, FrIday, March. 2, 2018. Scott Sommerdorf | The Salt Lake Tribune Brig Willard, left, of Bountiful tries to block the shot of Olympus' Harison Creer during second half play. Olympus beat Bountiful 79-43, in a boy's 5A semi-final, FrIday, March. 2, 2018. Another challenger steps up, another victim goes down. As has been the case 25 other times this season, Olympus stepped on a basketball court and dismissed an opponent. While the stakes are getting higher, Friday’s game was a Class 5A state semifinal, the margin of victory is staying large for the Titans. Olympus (26-0) cruised by Bountiful 79-43 to advance to a state championship game for a third year in a row. “Corner Canyon has got a lot of talent, a lot of guys. It’ll be a fun battle tomorrow,” said Titans junior point guard Rylan Jones after the 36-point win. He is committed to the University of Utah. The spread between the two teams gradually worked into double digits in the second quarter and stayed that way after a 10-2 run to end the period. Jones, who finished with 17 points, was the catalyst to that run as he beat the Braves’ defense for a solo fastbreak and a 31-20 lead then raced ahead to find teammate Jeremy DowDell for another layin at the 3:33 mark. Jones found Harrison Creer and Spencer Jones for open looks behind the 3-point arc with the Titans steadily increasing the lead in the third quarter. In both instances, Rylan Jones made offensive moves in the lane to juke defenders before dishing out. Creer’s trey from the corner it 48-27 and Spencer Jones popped another 3-pointer for a 54-29 margin a few possessions later. Jeremy DowDell finished with 26 points to lead all players, while fellow Olympians Spencer Jones and Creer added 13 apiece. 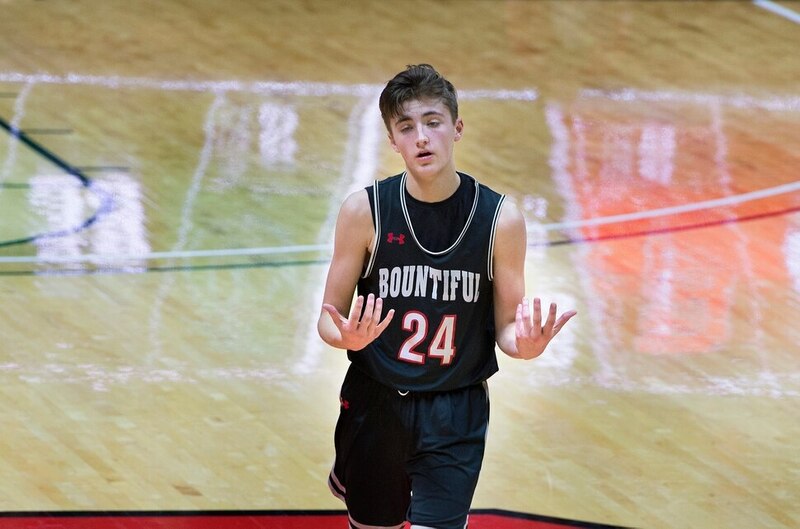 Bountiful (12-13) started the game with guard Camron Chism knocking down a pair of long 3-pointers. Brig Willard, who led Bountiful with 17 points, did his best to help the Braves keep pace by making mid-range shots. Willard connected on three of those in the third quarter, but the Titans had three 3-pointers in the same stretch of play. 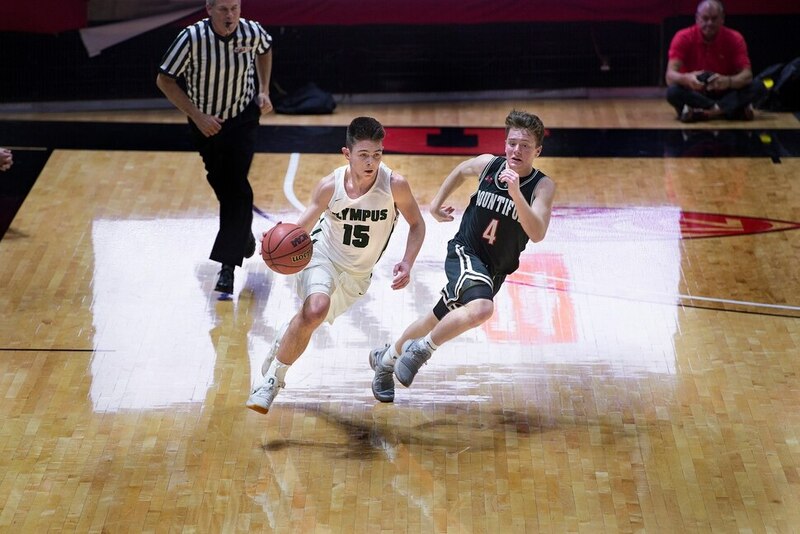 Olympus, which won the Class 4A state championship in 2016 then lost in the 2017 4A title game, will take on Corner Canyon for the Class 5A crown at 11 a.m. Saturday at the Huntsman Center.